GONE are the days where playgrounds are merely a slide and a set of swings, especially in the City of Wanneroo. Now technology is being used as part of a child’s playground experience, getting them outdoors instead of keeping them cooped up indoors. Kinkuna Park in Eglinton this week became the first smart playground in Australia to be fitted with multisensory technology, linking markers in equipment to a smartphone app. Families, including Andrea and Ian Devine with their children Nathan and Chloe, tested the new technology the day it was installed on Tuesday. Andrea Devine and son Nathan (4), looking on is her husband Ian and daughter Chloe (7). Markers on the equipment send instructions for playground games to the smartphone app, which a parent or supervisor remains in control of, creating an imaginary scenario combined with outdoor play. Already fitted with free WiFi, Kinkuna Park was designed as a new age playground where children can now set themselves challenges to meet through activities released on the smartphone app. 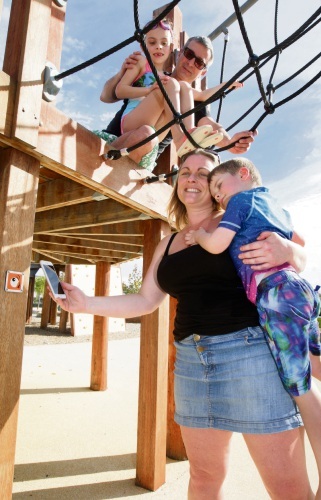 The installation of the technology was part of a three-month trial at the Allara estate playground made possible by developers Satterley Property Group and LandCorp. 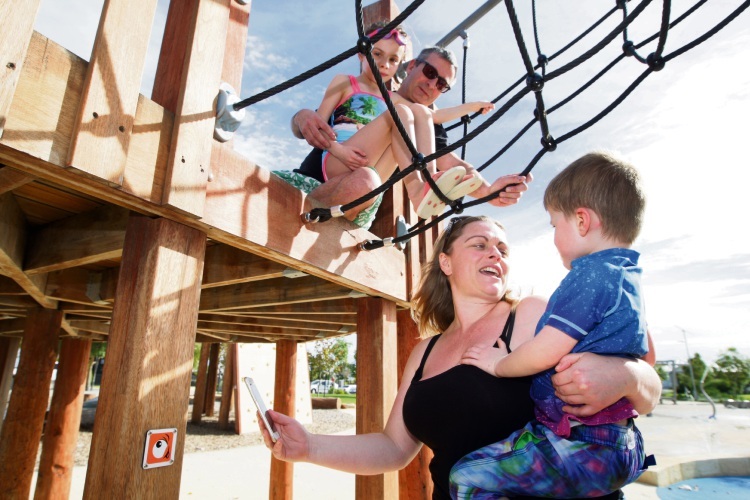 Following the trial, Wanneroo Council will decide if the technology should be introduced at other parks within the City, at a cost of about $2000 per playground.